Merlot and the Seven Salukis: Merlot and her 7 pups, born on June 26th, were found in an abandoned dog house in Ft. Worth by FWACC, and GALT was called in immediately to take custody of this precious family, our seventh. 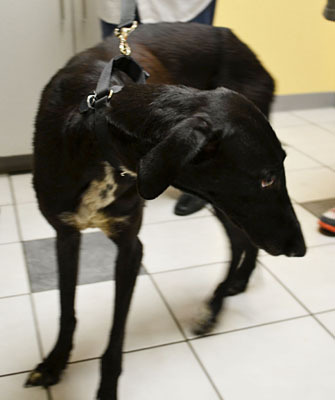 Merlot appears to be a saluki/greyhound mix; the father's lineage is unknown. Unfortunately, Merlot was covered in engorged ticks plus seed ticks and is running a very high fever after giving birth to these 7 plus 3 stillborn pups. She is spending the weekend at the 24 hour emergency clinic to get the care that she so desperately needs. Rest assured, the pups are in the care of loving, devoted GALT volunteers who are working diligently to get them started on the right foot. There are 4 boys and 3 girls and they will be bottle fed until they can eat solid food. The current estimate for Merlot's weekend care is over $4,000. She is receiving both intravenous fluids and antibiotics and is being closely monitored by the clinic staff. GALT depends on your kindness and compassion to continue to do its work of no grey turned away. Please help us help Merlot with her immediate care and her precious pups. No amount is too small. 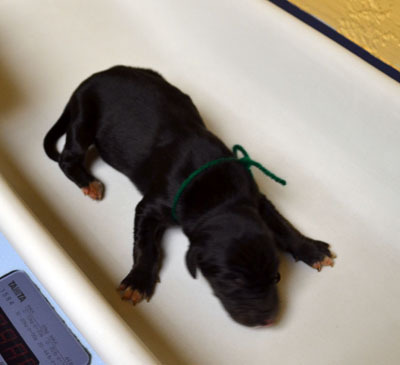 See the puppy and Merlot slideshow at the bottom of this page! 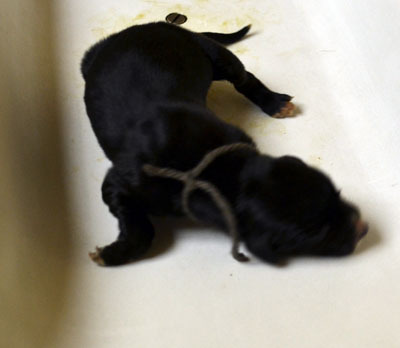 The puppies are in three different foster homes in two groups of two and one group of three. They are being bottle fed every 2 to 3 hours. They are eating well with encouragement, and have started treatment for intestinal parasites. See a video of a feeding. See a video of three pups moving around. 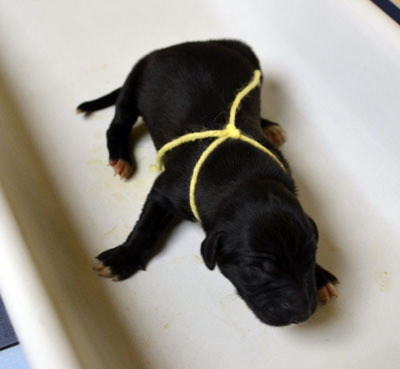 With great sadness, we must announce the passing of the smallest of the seven puppies. 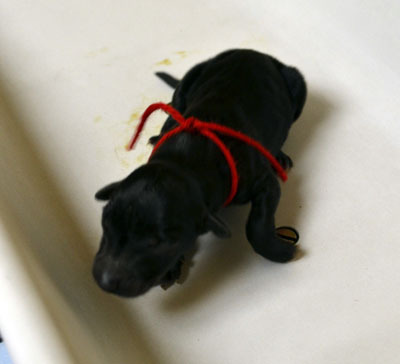 The boy with the red ribbon started out weighing just half a pound, and just was too small to thrive. He went to the rainbow bridge at 3 am this morning. 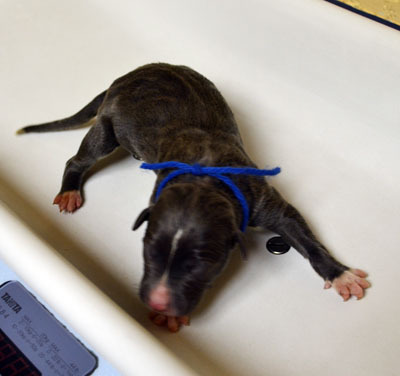 His foster mom tried mightily to save him,and has named him Spark. 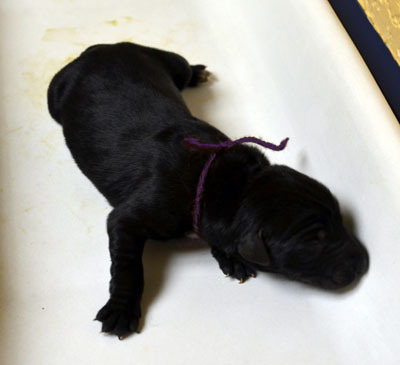 With enormous sadness, we must announce the passing of another of the seven puppies. The girl with the yellow ribbon developed a sniffle and was started on antibiotics. However, she grew lethargic, wouldn't eat, and faded away this morning at 2 am. Her foster mom tried mightly to save her, and has named her Gracie. 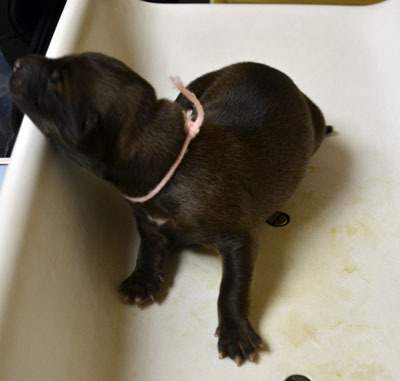 The remaining five puppies are doing well, ranging in size from 4 to 5 pounds for four of them and a little over 2 pounds for the fifth, who is healthy but seems to just have a smaller build. 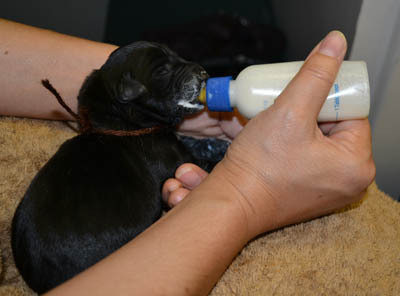 They are starting to transition off the bottle and on to solid food, starting with a mushy gruel. They are quite playful now that their eyes are open - see a video here. Merlot is also doing well - mealtimes are her favorite time and she's gaining some needed weight. She is being kept quiet in her foster home while she heals. She likes to stick close to her foster mom and also likes to talk to her. The special medical treatment cost needed by Merlot is why the Miss Mesa Fund was established. If you would like to help with Merlot's care, please take a moment to make a donation to the fund. You can use a credit card, check or PayPal by making the donation through the GALT GreytStore. You can also write a check (Greyhound Adoption League of Texas, P.O. Box 680, Addison, TX 75001) and note Miss Mesa Fund/Merlot on your check. You WILL and CAN make a difference in Merlot's life and the lives of other greyhounds in need of special medical care. Your help and support will make a difference... one greyhound at a time.